Home » Reviews » Harmony Big Boost Deluxe Booster with LATCH Review – the best big kid booster ever? Harmony Big Boost Deluxe Booster with LATCH Review – the best big kid booster ever? When it comes to backless boosters – there really isn’t much to rave about. Usually. 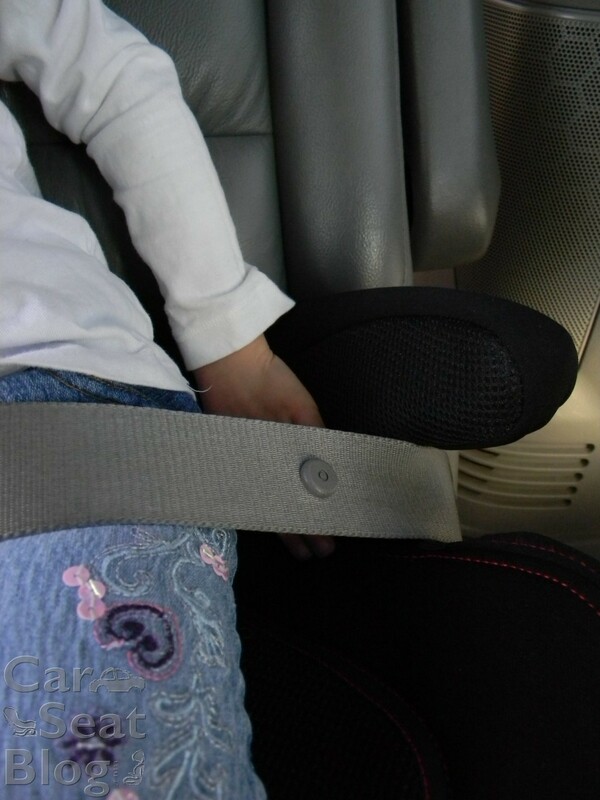 A backless booster is simply a positioning device meant to boost older kids so that the adult seatbelt fits them properly. 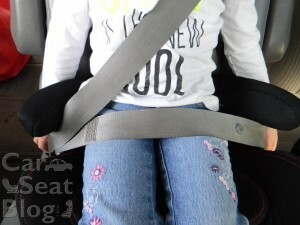 A backless booster is usually the last product that older kids will use before they can pass the 5-Step Test and transition to using just the adult seatbelt. Generally speaking, this doesn’t happen until about 10-12 years for most kids although there are always exceptions. The problem with a lot of backless boosters on the market right now is that they don’t actually fit many of the older, heavier kids who still need to use them. Many products claim weight limits of 100 lbs. or more but when you try to stick a kid who weighs 90+ lbs. in the seat, you quickly realize that those numbers don’t translate in the real world. Luckily, bigger kids are not a problem for the Harmony Big Boost Deluxe. 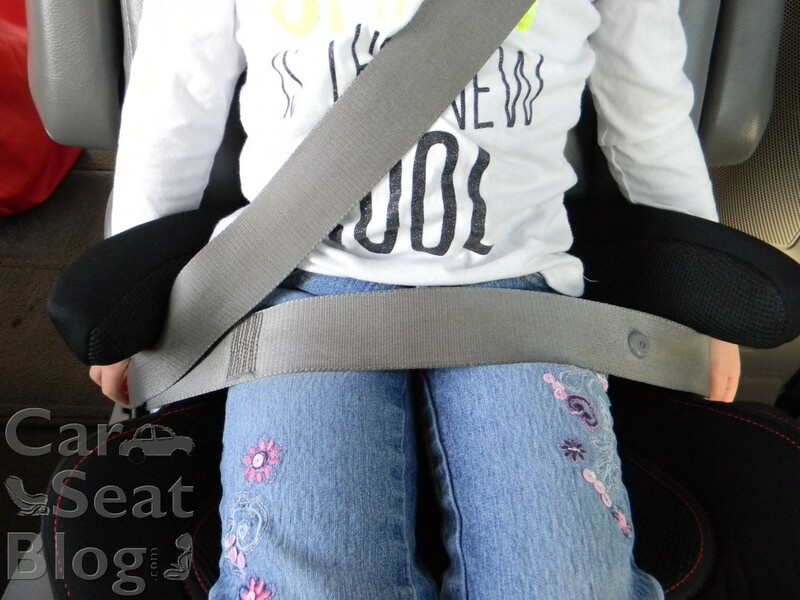 It seems to be the ideal booster for kids who may have trouble fitting comfortably in other backless boosters but really still need some help to fit properly in the adult seatbelt. On the downside, it doesn’t seem to fit smaller kids as well and that’s a concern since the minimum weight limit for this product is 30 lbs. Weight range: 30 – 110 lbs. On the opposite end of the weight range, here is what belt fit looks like in the same vehicle with a 5-year-old who weighs 37 lbs. and is 43″ tall. The belt fit isn’t terrible but the lap belt placement is a little too low in my opinion (across the femur instead of making contact with the pelvic bones) and when she scooted all the way to one side, she had about 4″ of room between her body and the other side of the booster. My honest opinion is that this product would be best suited for kids who weigh at least 50 lbs. 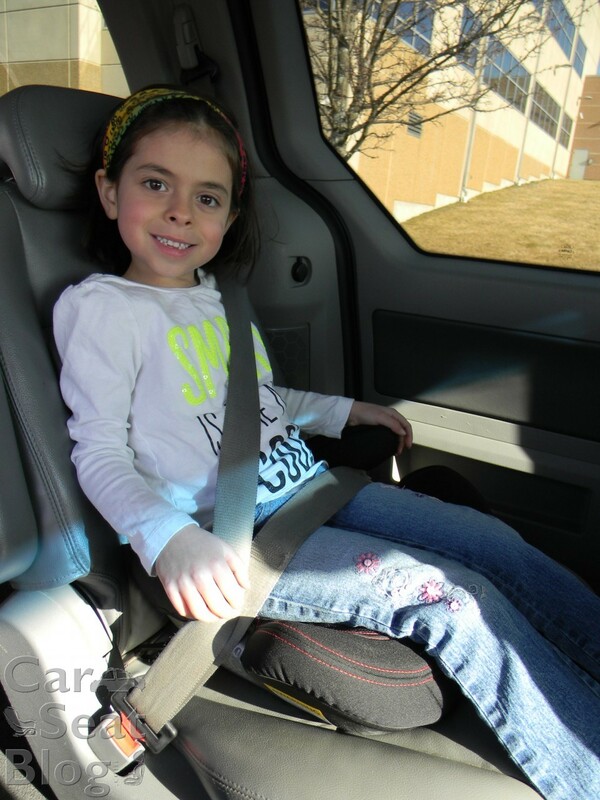 While no booster seat, including this one, can be used on an airplane because airplane seats only have lap belts (and you need a lap/shoulder seatbelt to use any booster), this product does make a great travel seat for older kids. 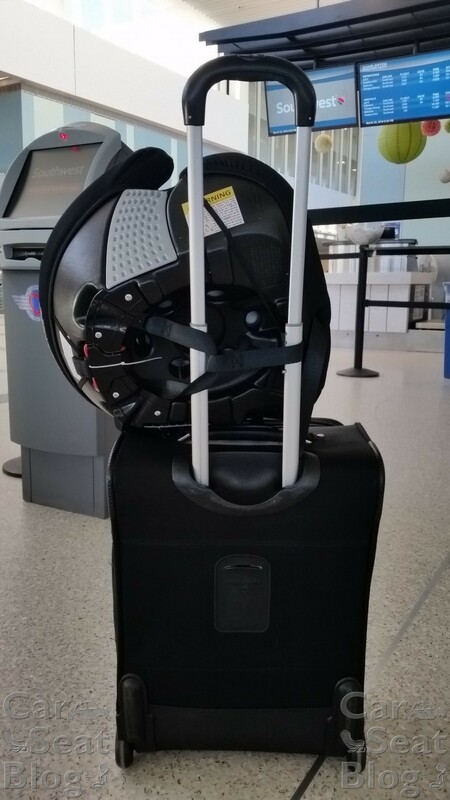 We recently flew with the Harmony Big Boost Deluxe and it fit easily in the overhead bin. It also stored nicely under the seat on the flight home when the overhead bins were full. 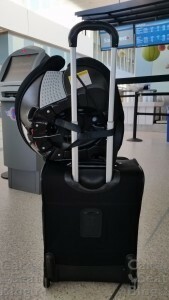 It’s super lightweight and the front adjuster strap that connects to the lower LATCH connectors made a handy loop for attaching the seat to our wheeled carry-on bag. If traveling with a backless booster, we always recommend taking it with you as carry-on even though your child can’t sit in it during the flight. A backless booster is small enough to be a carry-on item and if you bring it with you on the plane, it’s nearly impossible for it to be lost or damaged in transit. 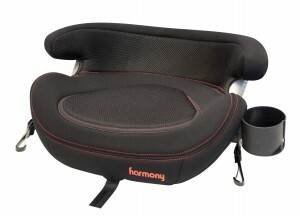 The Harmony Big Boost Deluxe in a welcome new product for bigger, older kids. It’s super comfortable and it does a great job positioning the seatbelt properly on bigger, older kids. While it isn’t the cheapest backless on the market (MSRP $24.99), it’s a great value for what you get – especially since it’s LATCHable. The only potential downsides are that it’s wide, may not be a great fit on smaller, lighter kids and currently it’s only available at Walmart. If you’re searching for a comfortable, LATCHable, backless booster and your kid is on the heavier side of the weight range – the Harmony Big Boost Deluxe definitely deserves your consideration. If you ask my kid, he’ll tell you to go for it because he claims it’s the most comfortable booster he has ever used. That’s an impressive endorsement coming from a kid who has used many different boosters in his short lifetime! Can you please explain how the shoulder belt positioning strap works? This would be the difference between buying this seat or a high back booster for me. TIA! 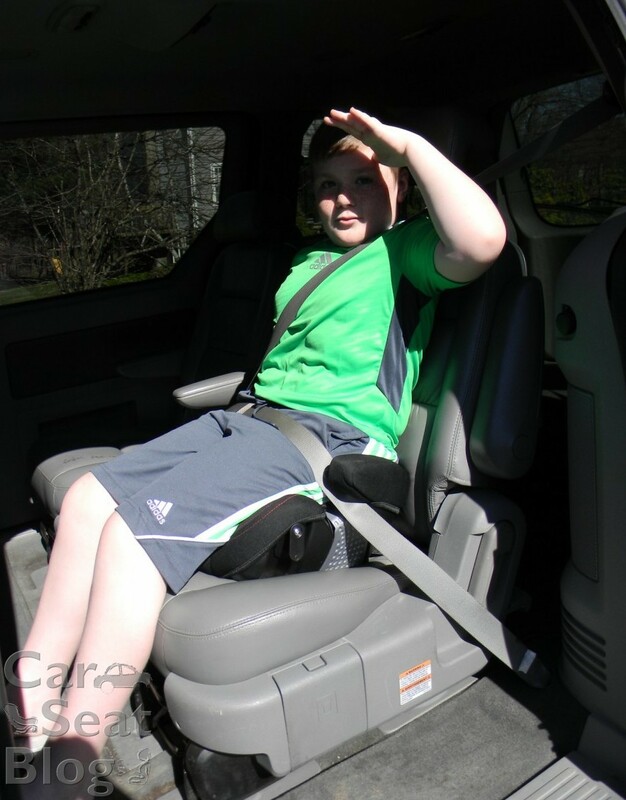 Was your son bothered at all by the little “lip” at the back of the seat? 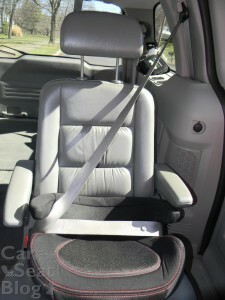 I’m considering getting one for my parent’s car because the Clek booster they currently have is not a hit with my kids. Hi Jane, no – not at all. I thought it might be a problem but it wasn’t. My son said it was the most comfortable booster he had ever tried which says a lot because he’s used many different ones over the years. I would love to see a comparison of this and the Youth in terms of lift provided. 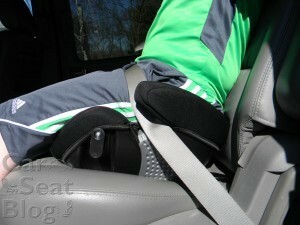 My friend needs a booster that provides less lift, like the Incognito, because of nonadjustable headrests. I saw this in store, and it feels so comfortable. My big question…how does it compare to the narrowness of the Harmony Youth? My 8 YO is in the Harmony Dreamtime which is narrow enough for her spot, and we were going to switch her to the Harmony Youth soon (tight 3 in a row). But I prefer a booster than latches. I played with the Youth and this booster side by side at Walmart and COULD NOT TELL if the new one would be as easy to use in terms of narrowness. ??? My 9 YO has an Incognito but I think at 57.7″ he probably is not going to be using a booster for long so for him, I see no point in getting one. (But my girl who will be 9 is not 60 lbs. so an Incognito for her isn’t a good option). It’s not narrow at all. I can measure all 3 later today (Dreamtime, Youth and Big Boost) but I can guarantee it’s a lot wider overall than the Dreamtime which is probably the most narrow dedicated booster on the market right now. The Youth booster isn’t really narrow because of the way it flares outward but I’m pretty sure this is one is wider. However, I will measure all 3 and keep you posted. Glad it’s a hit! I was way impressed with it on the shelf, I’m glad my insticts are right. The shallow depth is probably a real win in narrow third rows too, I bet. It’s nice to see another option for larger kids and that cup holder had me tempted, even though I already have 3 incognitos and so don’t need this. But that 57″ height limit stopped me. Thanks for the great review! Honestly, I wouldn’t let a height limit on a backless booster detract you from considering the product if it otherwise fit your needs. Overall height limits are so meaningless in the real world. 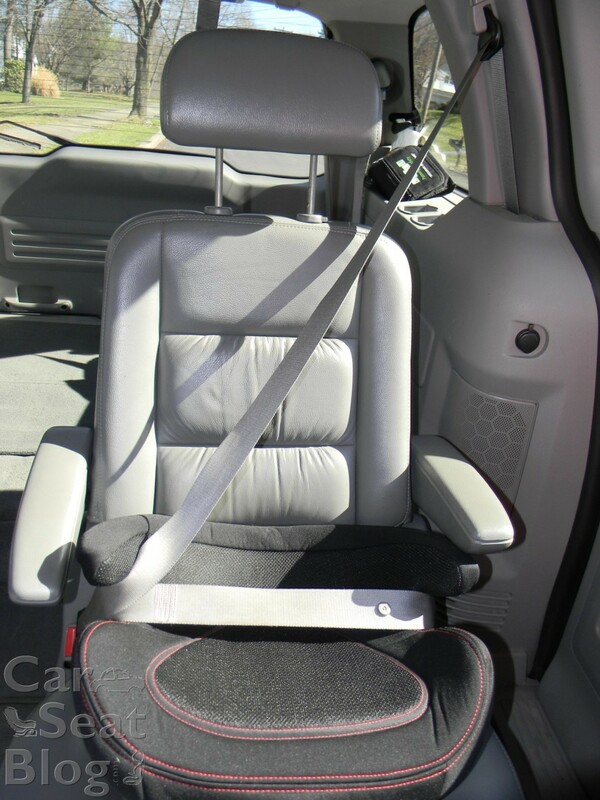 As long as your vehicle is able to provide adequate head restraint for the child, it’s fine. Thanks for the input. I’ll check it out if I find myself in a walmart.